Click to subscribe to this blog and receive notifications of new posts and complimentary white papers by email. consequences, either rewards or sanctions for the contractor, that are based on performance. Given the above, performance-based contracting seems to be fairly straight forward. Unfortunately the world is anything but straight forward in terms of variables that can and do effect the original criteria upon which a performance-based contract is structured. In short, there are natural changes in buyer requirements and supplier capabilities that occur over the life of a contract that cannot be anticipated from the outset. This includes political, economic, social, technological and environmental changes. As a result, what were once a clear and useful set of objectives, is no longer applicable in terms of achieving the desired relationship outcome. Like the analogy of the fruit from the poisonous tree, when objectives and corresponding capabilities inevitably change, both the data collection framework and the criteria upon which the rewards and sanctions are determined, are no longer relevant. The main question then becomes how do you manage this unknown yet expected change? Traditionally, the approach in terms of measuring post-execution contract performance is usually centered around the enforcement of the original contract terms and conditions. In other words, the contract itself becomes the driving force behind the attainment of buyer objectives and supplier responsibilities. This is similar to encountering an unexpected roadblock on a long journey that you had previously mapped out. Instead of looking for an alternative route you insist upon driving through the barricades. You ultimately know that you are not going to go too far, no matter how much you insist that you must stick to the original route. This insistence that you “stick with the original plan” – or in the case of performance-based contracting – the original terms and conditions of the contract, is the reason why so many relationships fail to deliver the desired outcomes. Yet we insist upon trying to manage the barricade as opposed to forging a new and better route, because we have not structured the agreement and more specifically stakeholder relationships, around a collaborative approach to inevitable change. In essence we have drawn a line in the sand that attempts to enforce a rigid set of original performance criteria that is more reflective of a penny wise and pound foolish mindset. Or to put it another way, we place a greater emphasis on how we do something as opposed to how we can actual get there. What we really need to do, is to recognize the fact that in order to be effective, a contract is a living document, and must therefore be flexible in its anticipation of the inevitable barricades that will come in the form of unanticipated change. As a result, we must establish an entirely new set of criteria that focuses upon the ability to respond to change, regardless of whether said change takes the form of a buyer’s shift in needs or the supply base capabilities. For example, what if the vehicle that you selected for the original journey is no longer suited to the terrain that you will have to take as a result of the roadblock? Keeping in mind once again that neither you nor the supplier could have anticipated the fact that the original route will no longer work, or that a change in way or vehicle would be needed. Do you still hold the supplier responsible for this? Do you indicate that by taking the contract it is the supplier’s sole responsibility to address the roadblock, and penalize them for any possible delays? This is the flaw in how performance-based contracting is implemented. Specifically the inherent inflexibility that first seeks to hold the supplier accountable to a rigid set of criteria, as opposed to seeking a mutually beneficial alternative solution. It is what I call the fork in the relationship road, because it forces the supplier to create a separate agenda that singularly reacts to challenges as opposed to jointly managing them with the buyer. Similar to a disgruntled passenger in the back seat fuming that their journey has been delayed or forced to take a road less travelled the buyer, by contractual choice mind you, is in effect no longer in the driver’s seat as a co-pilot. Like the Plexiglas partition in a taxi, a wall of limiting communication goes up, preventing the necessary collaboration that would lead to an arrival at a shared destination. In terms of complex, long-term relationships, performance-based contracting will only be able to produce positive outcomes or results within the context of a relational model. This is due to the fact that with the relational model, the emphasis becomes one of sourcing and managing relationships with vendors versus a prescribed set of performance statements of work. The end result is that a strategic fit between all stakeholders is maintained and aligned with the relationship’s original goals. 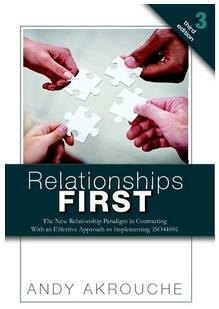 At the heart of the relational model, is the Relationship Charter. The Charter is the business arrangement framework within which contractual elements and metrics such as deliverables, incentives, timelines, financial obligations and service quality are jointly managed, measured and evolved. The Relationship Charter shifts the focus from one of adherence to a static set of vendor criteria within the confines of a single transaction, to one that places greater emphasis on ongoing collaborative problem solving. This means that there is a framework for the adjustment and alignment of capabilities involving all stakeholders, that reflect the real-world changes that have an impact on the ultimate success of an initiative. In short, with relational contracting, it is not how you get there, but that you get there. Editor’s Note: Interesting post from Andy Akrouche’s Relational Contracting Intelligence blog regarding performance-based contracting. Excellent commentary and I like your analogy. You are of course right about the practical challenges that will be encountered in any long-term performance-based contract and the need this creates for planned mechanisms to handle change. This ‘absence of certainty’ causes many to shy away from performance-based agreements; it is interesting in practice how few such agreements exist. This represents a great loss of opportunity for both buyers and suppliers. We are in complete agreement here Tim. Like traditional models, PBC views variability as a risk and not as opportunity to improve outcome. Unfortunately, PBC is the predominant way of doing things in certain industries particularly defence.